Another one of my Jeanswest Cyber Monday sale purchases! I bought this maxi skirt as a replacement for my plain black maxi skirt that I felt was getting a little worn. I am enjoying having both skirts in my wardrobe for the moment though. This maxi skirt is part of the "luxe" collection at Jeanswest which means it's quite a thick jersey. The side splits mean I'm still able to wear it over summer though as it has pretty good air flow. 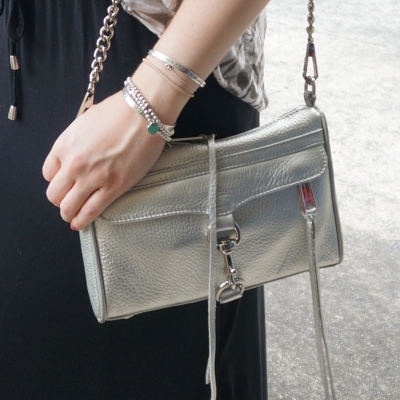 Followed a simple outfit formula the first two times I wore the skirt: a tank, a teething necklace and Rebecca Minkoff cross body bag. One colourful outfit, the other more neutral. I employed my usual trick of babywearing. With baby strapped to me I couldn't easily try things on no matter how tempted I was by the awesome sales (Jeanswest had an extra 50% off sale items so the sales were good!). Wearing this new skirt I bought last year reminded me I already had new things to wear still as well. Managed not to spend anything and stick to my no shop challenge. As I last wore this tank over a year ago I definitely didn't need to shop! Wanted to try a fitted tank tucked into this skirt to show off the drawstring waist. You can also see how high it sits on me because it's not a petite friendly length. Wearing it higher means I don't have to try get it hemmed shorter though. 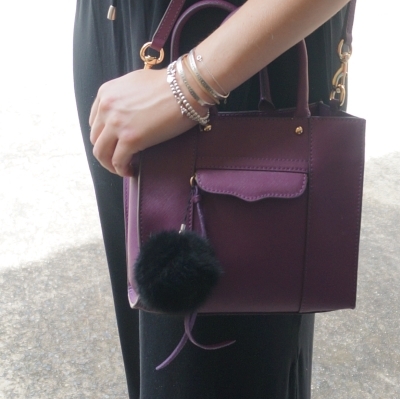 I picked the purple mini MAB tote bag as it tied in so well with the pink top and colours on the teething necklace. I really liked this outfit. I liked the pink tank and purple bag together last time I wore that combination too. Last worn: Ray-Ban Wayfarers, berry tank, Havaianas, Rebecca Minkoff mini MAB tote bag. First time I've worn the luxe jersey maxi skirt as it's a recent purchase. Other ways to wear: berry tank and pleated skirt, maxi skirt and neon tank, Rebecca Minkoff mini MAB tote bag and metallic tank. Took the boys out to rhyme time at the local library. Wanted a quick easy outfit to help make getting ready and out the door quicker. While the outfit formula is the same as the one above, with a printed and relaxed fit tank I think it looks quite different. I really liked how this necklace added a pop of colour with the neutrals too. Out of the two outfits with this skirt, I think this is my favourite. I do prefer this looser style top for breastfeeding over the fitted tank. This printed top is one of my favourites and I wear it sparingly, wanting to 'save' it for special occasions. I'm trying to make an effort to wear more of those kind of pieces in my wardrobe. Not only because I'm doing the 30 wears challenge, also because there's point in having clothes if I don't wear and enjoy them! Last worn: Ray-Ban Wayfarer (above), Sass & Bide tank, jersey maxi skirt (above), studded sandals, Rebecca Minkoff mini MAC. Other ways to wear: Sass & Bide tank and jeans, studded sandals and maternity denim, maxi skirt and stripes, Rebecca Minkoff mini MAC and navy kimono. Looking for more black maxi skirt outfit ideas? 30 ways to wear a black maxi skirt. Linking up with Let It Shine, Shoe & Tell, Modest Monday, Hello Monday. A good maxi skirt can be such a versatile piece and it already looks like you're making the most out of this one. Clever how you've been utilizing babywearing to keep from shopping ;p Happy weekend Mica! Babywearing is an amazing trick to stop you from shopping, works very well for me too. But my son is getting way to heavy for me to carry him around. Great maxi skirt! Impressed at your willpower to go shopping with the hubby and not shop yourself. Babywearing is a good idea. Once you get that wrap on, you don't want to have to take it off! It's nice that you can still wear the skirt higher - and it look great. Plus you can still wear it with heels if you don't hem it. Oh you're good - I usually spend my gift cards fairly quickly, haha! I love the skirt both ways! It goes particularly well with the pink top, love those colours together! I wish I was smart in saving Christmas gift cards so I can do a big splurge in April when Sephora has a sale but January was my birthday month so it's almost impossible to hold back. LOL! I love the second outfit the best too, the printed top looks amazing with the skirt. Love how versatile that maxi is! And living the bright pink, you look so sweet and pretty! Happy weekend!! I love how versatile that skirt is, and you styled it perfectly! Funny how you thought of that, but it does make sense- I mean I can see how babywearing prevented you from trying things on:) and hence meant less shopping. Thinking of which, I think I didn't buy anything clothes related this year. I did buy some tights but I was out of them and they are sort of a must have. So, I guess I'm doing pretty good when it comes to shopping less. I really do try to shop my closet....I was just thinking about how I should start spring cleaning earlier this year, and use it as an opportunity to go trough my clothes. I love both of these outfits. That maxi skirt looks great on you. The first outfit is very cute and I love that necklace with that top. The second outfit is so classy and chic. I love the combo of that printed top and that silver bag. Petite life, having to hike up maxi skirts! I like skirts with a thicker jersey, it is much better for hiding lumps and bumps. This looks like a sensible purchase in black! That skirt looks like a great staple piece, and I love how the drawstring makes it a little more fun. You have such a great way of taking wearable, everyday pieces that I could totally see myself wearing, and making fun, stylish looks out of them. I can't wait to do more babywearing too once I can face Violet out--the idea of having my hands free is so appealing! A black maxi skirt is such a classic piece! Totally versatile, too - love that you styled it two ways and both are great looks. A maxi skirt is something I don't actually own and wouldn't really know what to do with so you've really shown me the lengths such a simple, beautiful garment can go! I really love this maxi-skirt!! I use these kind of skirts a lot in summer!! Hey Mica! I recently found your blog and I am loving it. I adore how you styled this outfit. I'm definitely in need of a maxi myself. I hope you've enjoyed your weekend! The no shopping for 6 months sounds so hard! I love this skirt though it is SO versatile! Don't forget to link-up your gorgeous outfits this week! It is tricky, but so far I'm sticking to my no-shop challenge! Love both outfits! Maxi skirts are the best! I love wearing them!! Both looks are pretty. You are quite an expert of creating maxi skirt looks. I also adore collection of bags. Lovea good amxi and that necklace is adorable! Great purchase. I love the drawstring tie. Looks fabulous on you.